WWE is giving you the chance to rev up your vacation with this new WWE Universal Orlando Sweepstakes. Register now at WWE.com/UniversalSweeps and you could win a trip to Orlando, Florida to experience the VIP Preview of Fast & Furious Supercharged. Who Can Enter? 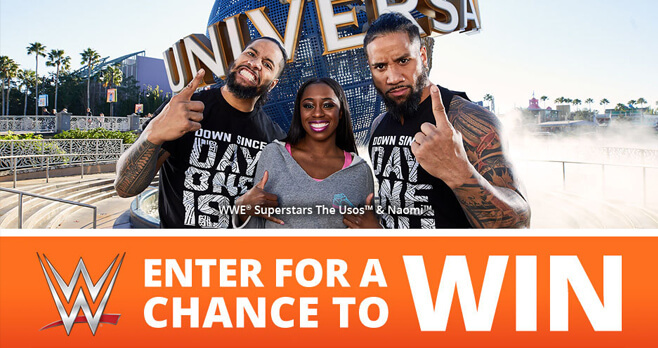 The WWE Universal Orlando Rev Up Your Vacation Sweepstakes 2018 is open only to natural persons who are legal residents of the United States of America physically residing in one of the 48 contiguous United States and the District of Columbia (excluding Alaska, Hawaii, Puerto Rico, Guam, the U.S. Virgin Islands and other U.S. territories) who have a valid social security or tax ID number, who are at least 18 years of age at the time of entry, and who have a valid email address. When To Enter? Sweepstakes begins at 12:01 AM (ET) on January 15, 2018 and ends at 11:59 PM (ET) on February 6, 2018. What Is The Universal Orlando Rev Up Your Vacation Sweepstakes Prize? The Grand Prize consists of a 4 day, 3 night trip for four to experience a VIP Preview of Universal Orlando’s newest ride “Fast & Furious – Supercharged” at Universal Orlando Resort in Orlando, Florida. Who Are The WWE Sweepstakes Winners? For the name of the winner, available after March 1, 2018, send a self-addressed, stamped envelope (Vermont residents may omit return postage) to: WWE’s Universal Orlando “Rev Up Your Vacation” Sweepstakes, 1241 East Main Street, Stamford, CT 06902. Requests must be received by September 30, 2018. I would love to go ive never got to go to a match in my life and I really want to meet them and going to meet them if my birthday wish I’ve been wishing to meet them every year but it never happened I should just stop dreaming I guess it’s never gonna happen ???????????????????????? Would love to meet them! I am A Huge Uso Fan, and it would Be My Dream To Meet Them It Would Be So Cool To Spend The Day With Them! I hope you pick me!! I can’t wait to find out!!???????????????????? I am a huge WWE fan and it would be a dream come true#feeltgeglow #day1ish?? He knows it’s one of my dreams!! I am disabled i would like to meet them. I am huge wwe fan!! Love WWE AND UNIVERSAL STUDIOS ORLANDO! !! !